OurEnergyPolicy.org | If a Tree Falls in the Forest…Should We Use It to Generate Electricity? California is experiencing what has been dubbed the worst epidemic of tree mortality in the state’s modern history, with the death of an estimated 66 million trees since 2010. There seems to be widespread – but not unanimous – agreement that leaving close to 40 million dry tons of wood in the forest will increase wildfire risk to unacceptable levels. A tree-mortality task force is working to safely remove the dying trees, some of which can be harvested for timber. But given the current trajectory, lots of wood will be burned on-site. This begs the question: are we better off using these trees to generate electricity? Teams of researchers have been documenting the costs of biomass generation versus “non-utilization” burning (i.e., on-site burning to reduce fire risk). Overall they find that, unless trees are located quite close to biomass generation facilities, the cost of extraction, processing, and transport to biomass generation facilities exceeds the market value of electricity generation. Some stakeholders argue that current market prices and policy incentives are failing to capture the benefits of biomass generation. Some argue that biomass generation affords the added benefit of displaced CO2e emissions in the electricity sector. But in California, CO2e emissions are regulated under a suite of climate change policies, some of which are binding. If, for example, the aggregate share of renewable energy generation is set by binding regulations, an increase in biomass generation may change the mix of fuels used to generate electricity, but not the level of CO2e emissions. Importantly, burning wood at biomass facilities (versus in open-piles or incineration) releases lower levels of other harmful pollutants like particulates. It is not clear how differences in emissions rates translate into health and environmental damage costs, but accounting for these environmental costs would presumably reduce the net cost of biomass generation relative to the more polluting alternative. Increased support for biomass generation makes sense if the benefits justify the added costs. On one hand, burning more wood at biomass facilities will incur additional operating costs. On the other hand, it will generate less local air pollution as compared to non-utilization burning and other potential benefits. Getting a better handle on these costs and benefits will be critical if we are going to make the best of this bad situation. This post was adapted from the Berkeley Energy Institute Blog. Original post can be viewed in full here. Despite costs that exceed market value, should policies support burning at biomass facilities over non-utilization burning in order to reduce emissions? Will an increase in biomass generation decrease demand for other renewable power generation, like wind and solar projects? 5 Responses to If a Tree Falls in the Forest…Should We Use It to Generate Electricity? Burning is not necessary. Slow ablative pyrolysis uses friction to input energy, which preferably could come from wind. A simple axially fed double disk mill (US Pat. 9,011,646 (2015)) the Shear Retort, radially extrudes biochar compost for soil enrichment and axially extracts naphthas for vehicle fuel. Biogas from digesters is not the highest and best use of biomass. Or traditional pyrolysis to make biochar. This would keep the CO2 out of the atmosphere, produce energy plus syngas and provide a soil amendment that improves plant growth. A future choice will be bio-energy with carbon capture and sequestration (BECCS). If done properly, this would be, like biochar, a carbon negative process. Beetle-killed trees in California (and elsewhere) are a large, immediate, and serious problem. The problem demands a solution that can be implemented quickly at adequate scale. That will be challenging. The immediacy of the need guarantees that any solution adopted will be less than ideal. Yet it would be tragic if the best we could manage is non-utilization burning. My (non-forestry professional) opinion is that time could be bought by a program of felling, stripping and shredding of small branches, followed by stacking of logs and large limbs in local clearings. Stacked logs are not a significant fire hazard, while the hazard from stacked limbs can probably be managed by spraying with slurries of water and clay. On steep slopes, gathering and stacking of felled trees isn’t a feasible option. But controlled felling and stripping of branches should still be able to reduce the forest fire hazard. On steep slopes, non-utilization burning isn’t a feasible option in any case. The only issue is whether the dead trees are more of a fire hazard if left standing with branches or felled and stripped. Once dead trees and branches have been stacked in clearings, they should be mostly safe for at least two decades. (My family has property in Colorado where stacked beetle-killed logs have gone three decades without serious rotting.) That leaves time to develop and deploy mobile equipment for processing the piles. As to what that processing should be, there are many options. Larger logs can be sawn for timber, while smaller logs can be sawn into strips for lamination into panels and engineered timber. Sawdust and piles of branches can be processed into torrefied wood pellets. The pellets can be transported to power plants, with economies similar to coal. Production of biochar is another option. Regardless of what options are pursued, the key to feasibility is a “mobile factory” that can move from one location to the next. My advice to the State of California would be to employ state resources, perhaps augmented by contractors, to implement an aggressive program of cutting, stripping, and stacking of dead trees. But hold off on non-utilization burning as much as possible. In parallel, entertain proposals from private companies on how they would utilize the stockpiled materials. Use a combination of small grants, loans, loan guarantees, charter rights, and possibly tax breaks to incentivize businesses to make productive use of the material in a manner that will make a positive contribution to carbon mitigation. This response is absolutely correct about timeframes and availability of appropriate technology. Utilization as a building material in Cross Laminated Timbers (CTL) sequesters a lot of the CO2 in the wood. Rapid deployment of this technology requires education and some code modifications. This use will be the highest value and result in the highest GHG off set as this product replaces concrete, a large source of CO2. To harvest and store will require up-front money, probably from government, but it would be a good investment compared to costs from fire fighting and insurance payouts. Maybe insurance companies could be convinced to contribute to a fund to support storing in place. Limbs and branches are another matter. Their only real use is energy and movement of biomass for energy or other low value uses has its geographic limits. Chipping and storing these branches might work, but there may be an issue of decomposition creating methane. Manufacturing of CLTs is not a high tech proposition. A CLT factory could be designed as a movable facility with much of the equipment skid mounted or in shipping containers. CLT manufacturing will require energy and in situ generation from the limbs and wastes makes a lot of sense. Such a scenario would be relatively low CAPEX compared to other potential utilization options and would return the highest value. I know that within the supporters of CLT as a ‘green’ building system, utilization of infested trees is being discussed. The USDA forestry department is really behind CLTs and the solution will need to be a government/private venture. CLT is a technology developed and working now; it only needs a bigger market. 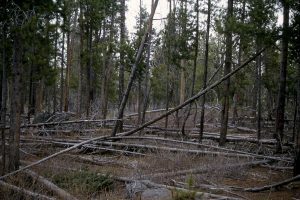 The author is absolutely correct that dead and dying trees, infected trees, and tree slash that cannot be naturally absorbed on the forest floor should be routinely harvested and utilized for energy, fertilizers, road bedding, and other bio-products rather than direct burning or allowing them to turn into tinder causing forest fires. This biomass, that cannot be naturally absorbed into the forest floor, also degrades to methane which is a very potent greenhouse gas (though shorter-lived than carbon). The same is true for animal manures, poultry litters, food processing wastes, contaminated grains and other food stocks, human sewage, and biosolids filtered at municipal water plants. We need to look at our wastes, not as wastes, but feedstocks for fertilizers, bio-chemicals, building and road bedding materials, and energy, among other products. Biomass, based on smart waste utilization — while insuring that a scientific understanding of what biomass needs to be left to retain soil nutrients for forest and farmland — is an important tool to reduce methane emissions accelerating climate change, reducing wastes that become tinder to accelerate forest fires, reduce wastes that nutrient load and pollute waterways and groundwater, and finally, create economic jobs and economic wealth in agricultural and forest communities. From an energy point-of-view cellulosic conversion allows such resources to be used for transportation fuels. Anaerobic digestion and biomass gasification can turn biomass into thermal energy and electricity. There is no down side, only opportunity.